Lyza taught me to do this sambal sotong. It is really simple and easy. If you have a blender, it is even easier. The above are all the ingredients needed and yet, with some flavourings, the dish tastes great. What you see above are two large onions, several dried chillies which I had de-seeded and boiled in hot water and one large ‘sotong basah’ or the brown squid. I am awfully afraid of getting my hands ‘hot’ after touching the dried chillies. Now, I have learned the trick. What I did was to remove the seeds by slicing open the dried chillies with a kitchen scissors. 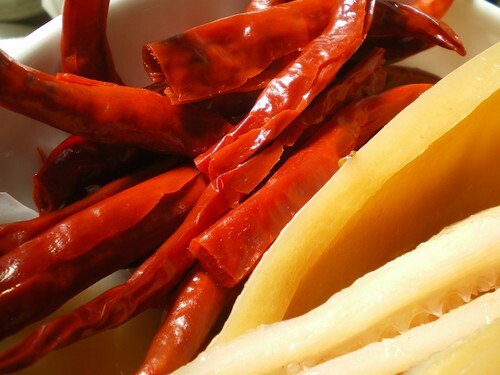 Never touch dried chillies when moist/wet because the heat of the chillies are very, very hot and will stay for a long time. After removing the seed, boil the dried chillies so it is easier to blend. For convenient sake, I use large yellow onions. Shallots or purple onions will produce better tasting and much more fragrant curries and sambals. But I dislike getting teary when peeling them. So, I normally buy yellow onions. 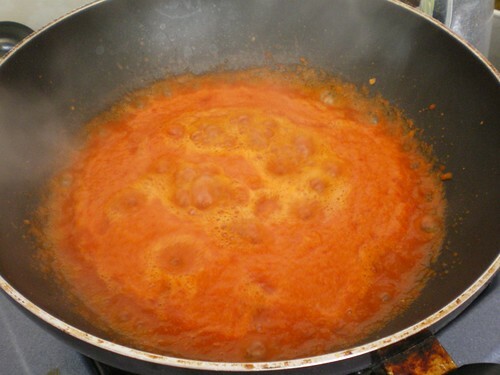 To get this hot chillies paste, what I did was to blend the two onions and bunch of chillies with some water. Then, I stir fry them in the wok with some oil. If you have belacan, do add some as it will gives a better taste. The bubbling chilly paste is one mean concoction there. Cover it up or else the oil and chillies will splattered all over your kitchen top and worst still, sting your hands. 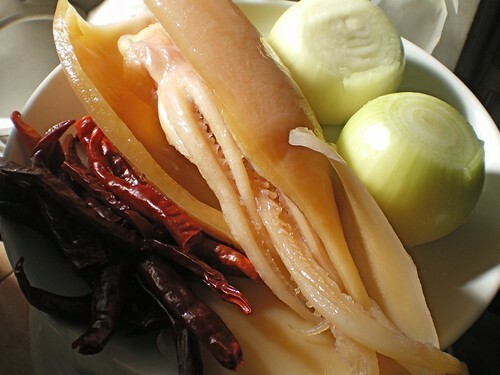 Add some sugar, salt, tamarind juice (or vinegar) and when the taste is perfect, add the squids. Do not overcook the squid as it will turn rubbery. Just heat through will do. Other than this brown squid, you can also use prawns, fresh squids, fried eggs, hard boiled eggs or ikan bilis. The paste is very versatile and tastes good with nasi lemak. In case you want to learn how to cut criss-cross designs on squids or how to clean squids. You can get the recipe for nasi lemak on this post and you are on your way to another Ubah Gaya Hidup, save money cooking your own nasi lemak. looks delicious! nasi lemak with samba sotong outside easily cost rm4.50 or so. ohhhhh … I just made some last weekend to distribute to friends …:) … betul2 senang … and oso udang and petai …. 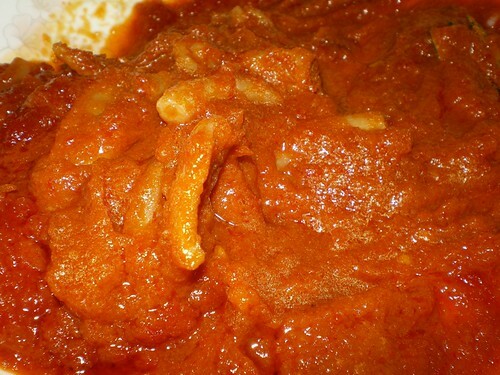 so syiok…..
I’m really not good in cooking spicy dish. But I like to eat, of course not so hot one lah. I see the way you cook it, seems very easy. I must give a try as Sambal Sotong is my favorite. Thanks for sharing this. Lilian, petua org2 tua. To get rid of the ‘hot hand’ after handling the chillies, try to soak your hand in tea water and scrub your hand with the tea leaves while soaking. that is one of my late mom petua. It really work. 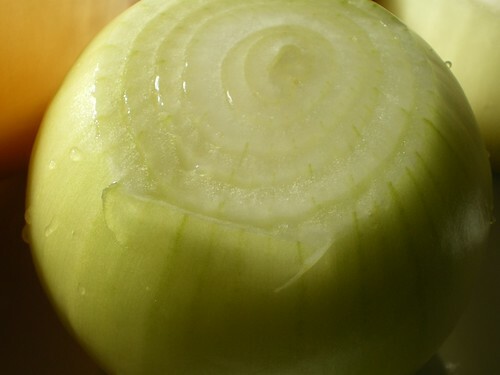 A tip on peeling shallots/ onions – you only need to cut off both ends and then soak the onions / shallots in water for about 15 mins and all the skin will come out. Easy and no tears. Thanks for your sambal sotong recepi. I live in California and would like to have the Malaysian apong (the simple crispy ones that sell in pasar malam) recepi. If you have or should come across the recepi I would appreciate it very much a copy of it. Again, thanks for your wonderful site.